When I was a youngster we went on a roadtrip to the mountains of Italy in our Campervan. As we left to come home one of the ancient Italian grannies we had met at the camp pressed a package into our hands. At lunchtime we opened up the paper and revealed a thing of beauty – a Spaghetti Pie! We settled in a picnic bay by the road and devoured every crumb. 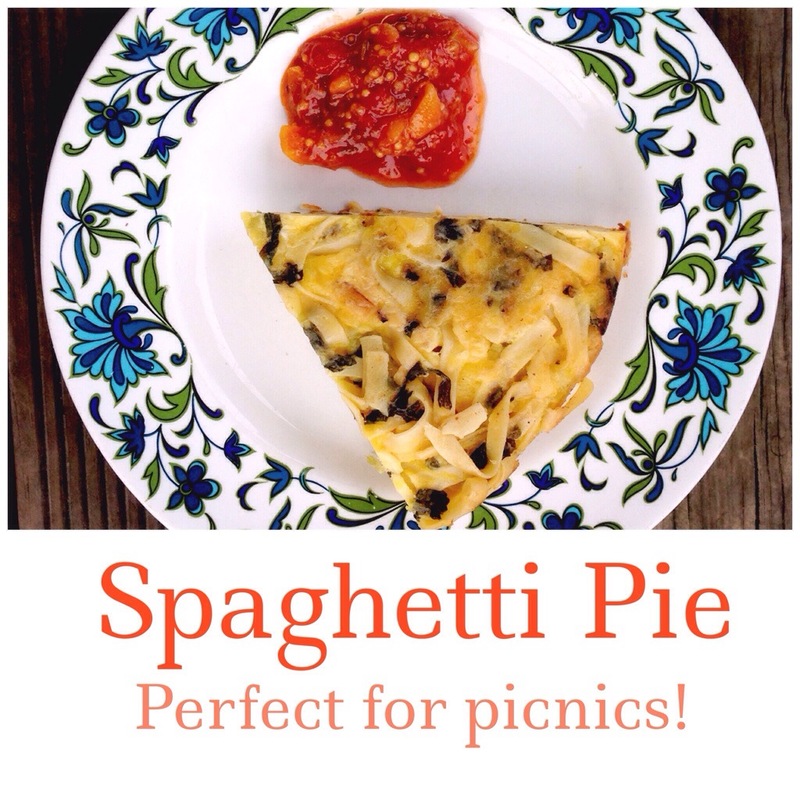 It remains my favourite picnic memory of all time and I make it for my own family whenever we go on a road trip! It is such a great picnic food because it actually tastes WAY better the day after it is made and I normally just have it cooking alongside the meal I am making to eat. (It is best when half forgotten about on a low, low hob.) You might recognise the recipe as it is pretty much fritata but with pasta instead of potatoes. Fry up onion and veg until onion is transparent and veg is cooked (7 mins or so) Throw in the crushed garlic for the last two minutes of cooking. Add the spaghetti to the eggs and mic well. Add the veg and onion and garlic to the eggs and spaghetti and mix well. Add salt and cheese and mix well. Meanwhile wipe the frying pan clean and melt three quarters of the butter in the pan- slosh it up all the sides of the pan. Pour the spaghetti and egg mixture into the pan- flatten it all out so there is an even spread. When all the liquid has been cooked and it is firm transfer the pie to a plate (put a plate on top of the pie and turn the pan upside down so the pie is transferred to the plate) then melt the rest of the butter and put the pie upside down into the pan to brown off the other side- 10 minutes on medium heat. 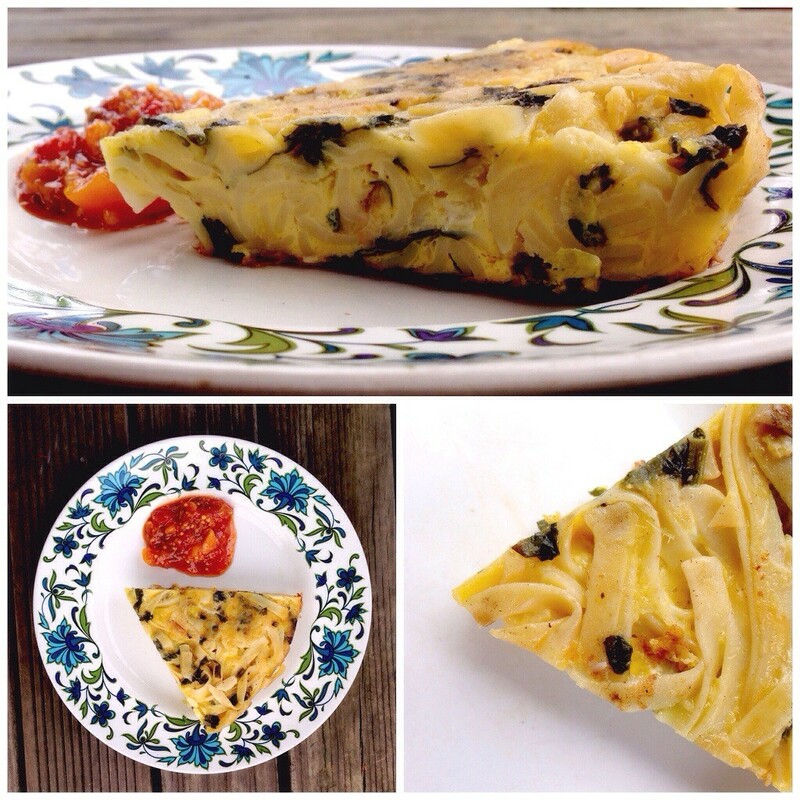 Cool and pop in freezer- serve the next day with chutney and a bit of salad. It will do four adults at a picnic I reckon.